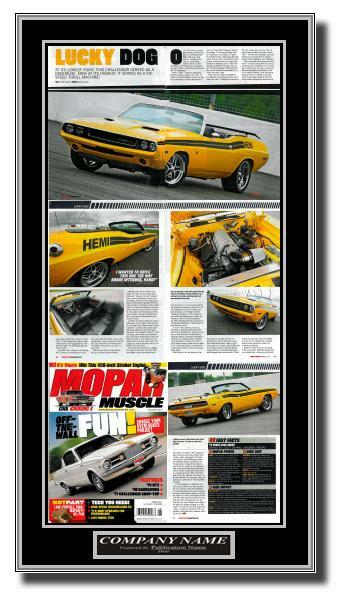 Just talked to a guy that had his car on the cover of Mopar Muscle last month. He called in wanting an In The News T-Shirt and to thank me again for the work we did. I made a plaque for him on his feature and he called back absolutely thrilled. It seems his brother was the real magician on the restoration and did a ton of work for his big brother. The plaque came out so nice that he purchased one and had me send it to his brother. He had to call me back and tell me about the experience. It’s one thing to commemorate an achievement, it’s quite another to award someone with a plaque signifying their hard work and dedication that made it all possible. I love the aspect of this job that allows me to be the angel of good news and to congratulate people on their accomplishments. The power that these plaques possess gets overlooked by many. The truly intelligent people know that the simple act of buying a plaque not just prolongs their 15 minutes of fame, but extends it infinitely. We have several client “TV Stars” who all started out with a simple car or bike in a magazine. A great restaurant review that they bought a plaque of and hung it up for everyone to see. This started the ball rolling with more articles in better more prominent publications and soon made them the “force majeure” in their industry. When television producers look for subjects to work with, they search for the leaders in the industry and 99% of the time those people are not just the ones with the most press, but ones who used those articles as stepping stones to the next level. Marketing one’s self isn’t egotistical, it’s necessary to build that foundation from which to benchmark their own standards and excel to the next level. Buy a plaque and start building your wall of fame…it’s just good business.